Fame! Now, if only fortune would follow…. This entry was posted in Reading on September 23, 2007 by Espen. 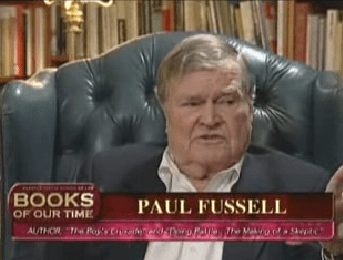 One of my favorite authors, Paul Fussell, is interviewed for two house (part I – part II) on Doing Battle – The Making of a Skeptic and The Boys’ Crusade. This shows the value of Wikipedia (where I found the link) and distribution of video over the Internet. I don’t think there are that many people interested in an hour’s interview with an author not much published in Norway. On a Sunday morning, to boot. By the way, here is “The Mucker Pose“, the essay Fussell talks about, unfortunately behind Harper’s paywall, but they will learn eventually. Paul Krugman complains that his colleagues write like theater critics rather than critical journalists. I have seen the same thing happening here in Norway. The reason, of course, is that actually figuring out what is going on and explaining it to the public is hard work, requiring understanding, a facility of explanation, empathy with the audience and, most importantly, the need to change your physical location to somewhere less pleasant than press conferences. Side note: I blog about Paul Krugman because he is no longer behind the NYT paywall. Modern media can in essence choose between relevancy and payment, and NYT took the longer-term view. Good. This entry was posted in Business as unusual on September 22, 2007 by Espen. A piece of really good news to start the day: Stephen Fry, one of the worlds smarter and funnier specimens and certainly one of my favorite authors, has a blog! One entry so far, on gadgets (that may have cured me of coveting the Nokia E90, but there is that keyboard…. ), but given his legendary productivity at the keyboard and virtuosity with a sentence, there will be more, and it will be good. This entry was posted in Blogging on September 20, 2007 by Espen. Synopsis: Religion is, on overwhelming balance, a force for evil in the world. It is unnecessary, malevolent, and impedes mankind’s march towards truth and a livable future. Time to rid ourselves of it. The man can write. And read. He analyzes the old and the new testament, the koran, and every other religion in between, including those long dead and those yet rising. For all of them, he shows how their foundations are built on sand – “fabricated non-events” – and have been changed up through the ages to suit the agenda of clergy and state. Hitchens speaks from first-hand experience: He has traveled widely, has been seen as a god himself (in Turkey), and was a witness against the beatification of Mother Theresa, showing how one of her purported miracles was due to new technology and old-fashioned journalistic gullibility and wishful thinking. Hitchens systematically smashes each claim religion may have on our lives: Religion kills more people than it saves, it can be hazardous to your health, its claims to holiness and history are false (the three large monotheistic religions are largely plagiarized from other, older religions and each other), has nothing to offer when it comes to explain why the world is here and how it got started. It does not offer moral guidance – he argues that chances are people would behave more morally and ethically if they were sure this was the only life. God did not make man in his image – man made god in his. Mr. Hitchens is not an easy read, but he is very enjoyable. His references and examples go wide and deep, he has read everything and refers to it with little explanation and sometimes little context. But his searing wit, mercilessly logical chains of argument, and illuminating illustrations comes down on the better side of something that could have become a rant with any other writer. This is not a hastily composed monologue or an unconnected series of articles – Hitchens has been writing this book all his life, and will continue to write it. Now if he would only make the next version include an equally powerful argument against alternative medicine and New Age superstition…. Highly recommended. If you are religious, you need this book to understand what you are in for (and what you need to surmount if you really want to believe.) If you are not, read it for pleasure and to stock up on arguments. 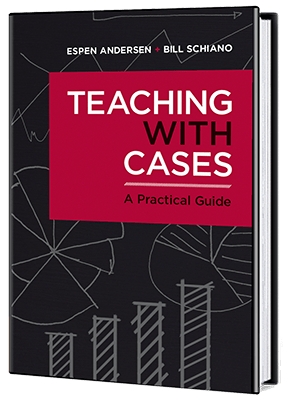 In any case, read it for the language and the power of logic and learning. PS: Here is a fun account by Hitchens himself about the book tour. Heaven forbid (there we go again) I would have to argue against him in any debate…. PSPS: Here is a great interview/radio debate with Hitchens, from WBUR Boston. This entry was posted in Reading on September 18, 2007 by Espen. 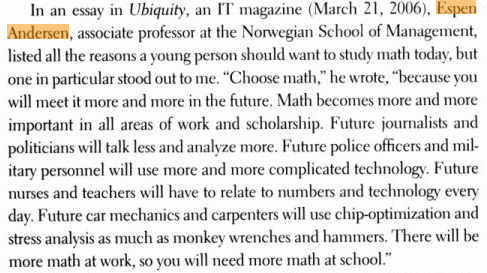 Business by numbers about the inreasing use of algorithms in business. While the examples are a bit trite (the Lune algorithm for credit card number check, for instance, which as far as I know has largely been replaced by a modulo 11 control in Europe) it is a nice overview. The Death of Expertise, review of new book by Ian Ayres called Super Crunchers, about how more and more decisions are automated (since computers can do them better than humans) and how humans can be reduced to providing input parameters for automatic decision making. (Incidentally, the title was chosen with help from Google). First para: EVERY time a world-class chess player loses to a computer, humans die a little. In this book Ian Ayres, a professor of law and management at Yale University, explains how in many less high-profile endeavours, human intuition and flair are more easily beaten. The sheer quantity of data and the computer power now available make it possible for automated processes to surpass human experts in fields as diverse as rating wines, writing film dialogue and choosing titles for books. This is something we have talked about in my research project on search: How approaches based on improving decisions based on capturing user reactions (such as the music site last.fm) win over categorization-based schemes (such as pandora.com) even though the former sometimes make stupid decisions (such as grouping music together because the artists come from the same city.). This entry was posted in Digital reflections on September 18, 2007 by Espen. Jon Udell has an extremely interesting post about Ed Iacobucci and the reinvention of air travel, essentially moving from a hub-and-spoke routing model (which is akin to line switching of a telephone network) to a model that more resembles packet switching. Instead of holding routes constant and let the passenger’s time be a variable, this approach allows the passenger to price his or her own time, and have the airline (with smaller and more flexible jets) respond accordingly. Very interesting, especially in relation to the concept of free flight, where air planes choose their own routes (and, implicitly, manage their own security envelopes) from one destination to another. This entry was posted in Business as unusual on September 15, 2007 by Espen.